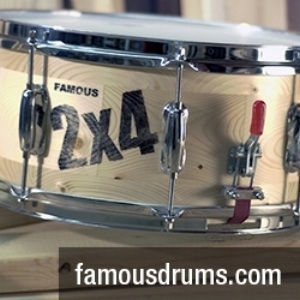 Here’s another snare drum to enter into the collection. This one came from Ebay a few months ago. The seller was kind enough to end the auction early for me. 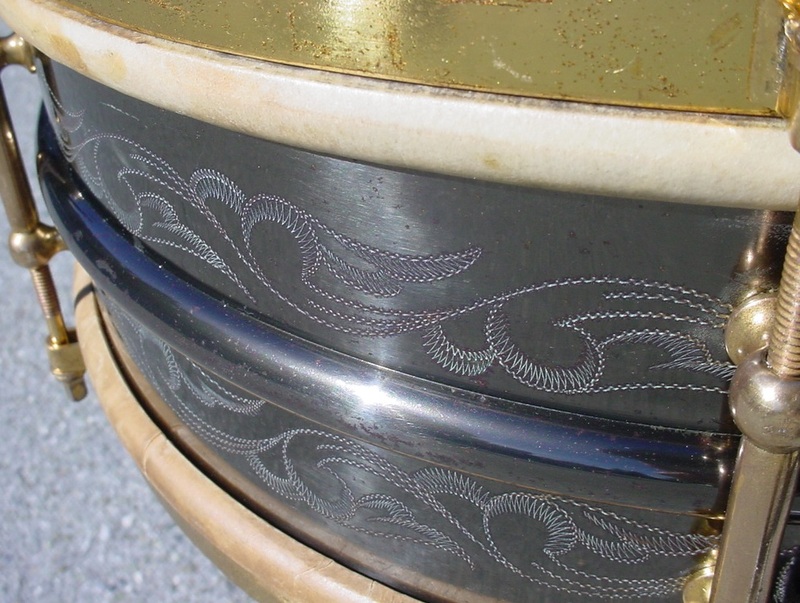 From what I have been told there were three L & L engravers during the DeLuxe/Black Beauty era so the question is: did one of these engravers get a special order to enhance the typical scroll/wave engraving on this drum or was there a fourth “scratcher” in their midst? 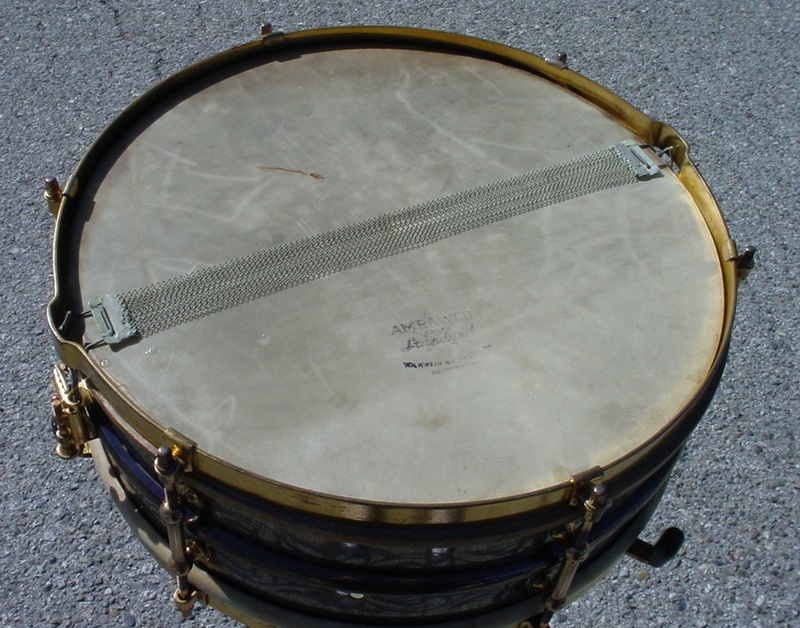 Thanks to Bill Wanser for helping date this drum from 1919-1922. In 1923 L & L went to an 8 lug shell and single flanged rims on their Professional Models. 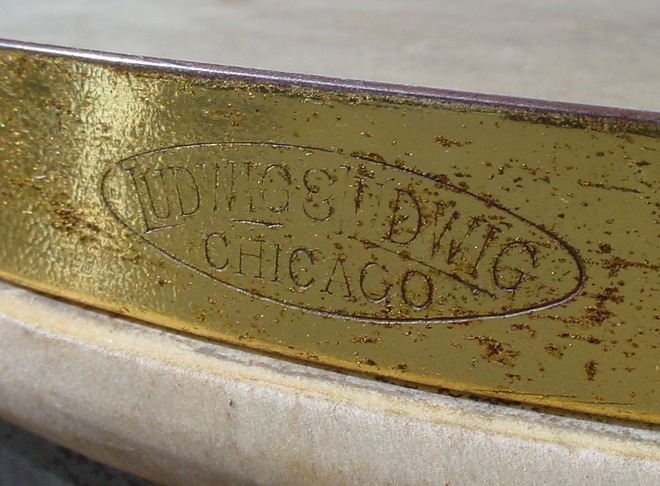 The seller informed me that the original owner was a dentist in the Midwest named Dr. Donald R. Skillen. 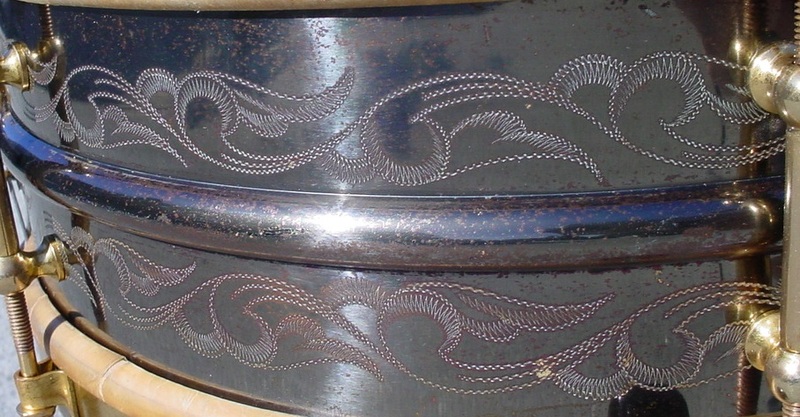 You can see where he had the drum personalized but unfortunately (or fortunately) the engraving except for the date is covered up by the top head. Still a nice artifact from the era. Bonus time...from the eBay photos my hunch was correct, the hardware is gold plated. 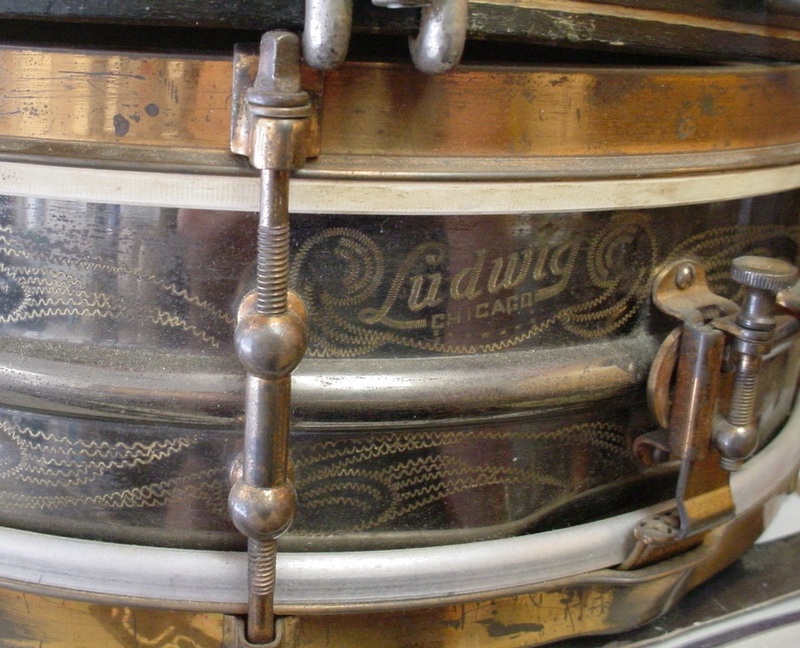 The single band rims are in round with a strong oval Ludwig & Ludwig stamp on the top rim. All of the hardware still had a good amount of gold plating so I just cleaned everything with some 3-In-One oil. As always the steel tension rods needed more attention so after cleaning them I gave them a few coats of clear lacquer to prevent any rust from occurring in the future. Someone added a metal “bar” covering two holes in the strainer gut piece and the snare cord was attached to this. I am guessing that the owner thought this was a better way to attach the snare cord. I also decided to leave it as is...another cool artifact that came with the drum. 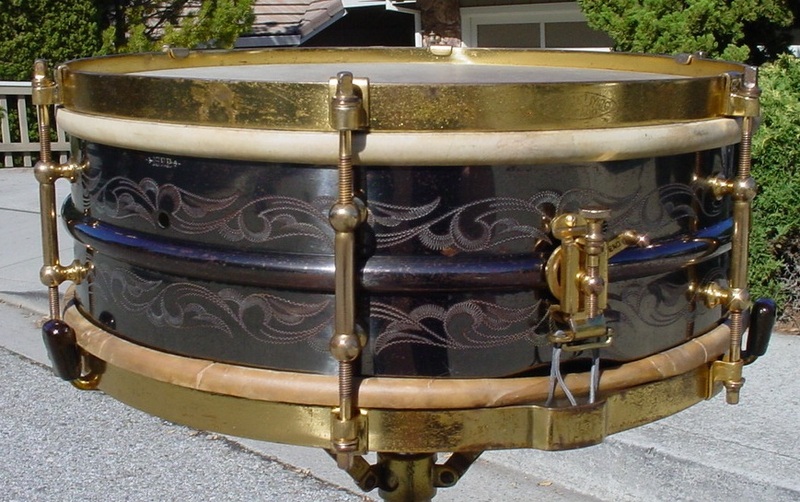 Of-the-era top and bottom calf heads and James Snappi Snares rounded out this cleaning /restoration.